Our selection comes from the Duvigneau Family, who have been tending the same plot of land for over 80 years. It is located on the Right Bank of the Gironde River in France's Bordeaux region. Bordeaux is considered the largest fine wine district in the world, a claim that is difficult to argue. There are larger wine districts for sure, but it's the "fine wine" moniker that sets it apart. It is also as diverse as it is large. Though the area mostly produces reds, Bordeaux makes a considerable amount of sweet wine - among the world's best - and a few of the most sought-after whites on the planet. The soils here are quite diverse, but the grapes are pretty much the same all over. It is the soil that makes the difference in the Merlot and Cabernet Sauvignon for reds, and the Sauvignon Blanc and S?millon for whites and dessert wines. 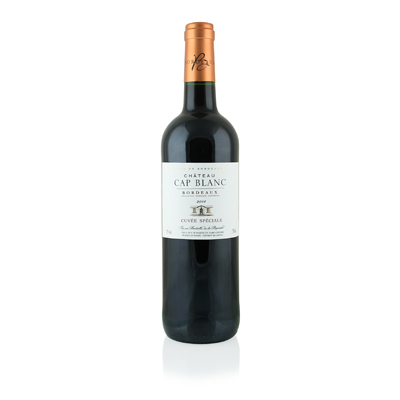 Cap Blanc began four generations ago, with less than 10 acres. Each generation of the Duvigneau Family added vines judiciously until it attained its current state: over 50 acres. Our selection is the classic blend of 80% Merlot and 20% Cabernet Sauvignon. Merlot from this area is much sturdier and more tannic than we find elsewhere. Most would mistake it for Cabernet Sauvignon. What we have here is solid, dense and bold flavors of berry and earth, mixed with a touch of saddle leather. Medium tannins finish with a flourish.